as usual I’ve made a start. Many thanks to Lynn for the photograph in which her late father Harold Smith (R Etchells’s crew, 625 Squadron) is far right, middle row. Harold’s operational career was cut short by ill-health and Bill Hay replaced him after the Ives crew was split-up. More about Harold Smith to come in a subsequent post. 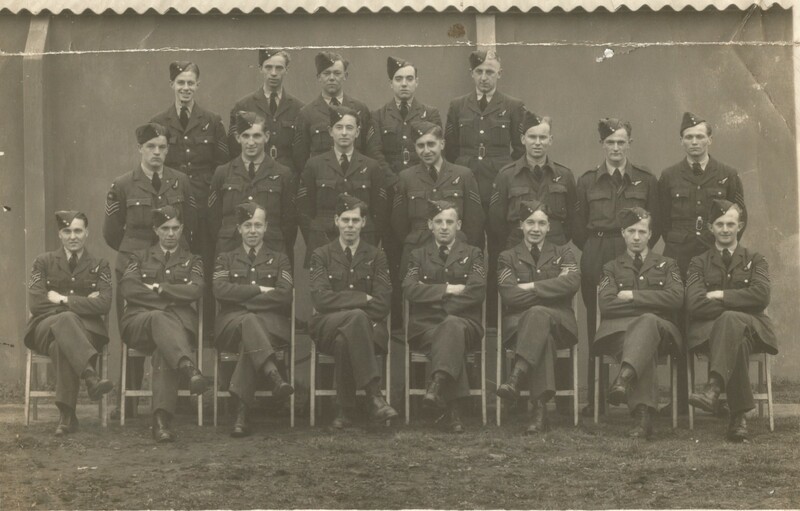 My own eye was drawn to a familiar face seated far right, immediately in front of Harold – Donald ‘Doc’ Savage (Dunckley crew 100 Squadron, later cousin Jim Ives’s inherited crew). It took me a while to recognise D P J Savage’s signature – I was reading it as ‘Savoy’ until the penny dropped. right :- Sgt Don ‘Doc’ Savage 100 Sqn, Ives crew. 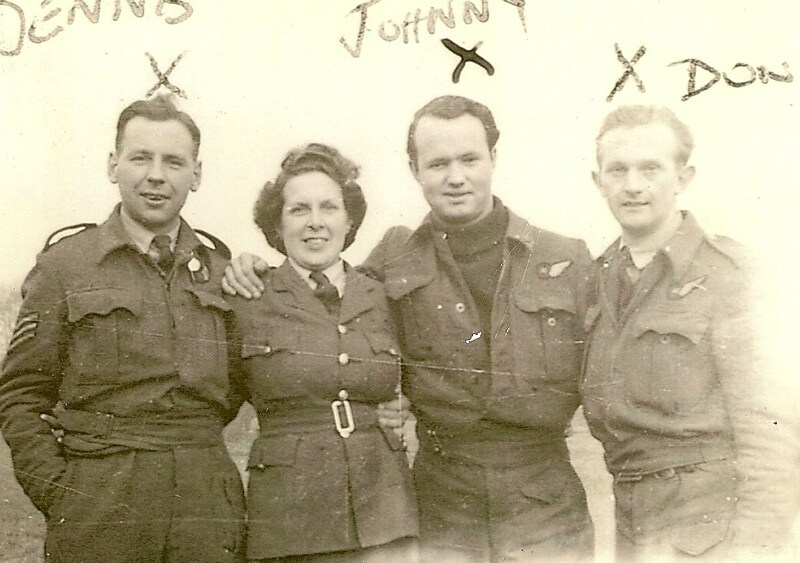 Sgt F Seddon was w/op in the 626 Squadron crew of F/Sgt J Jacques. Sgt Seddon became a P o W when their aircraft was shot down by a Ju88 over Erfurt on 15th February 1944 Berlin operation. 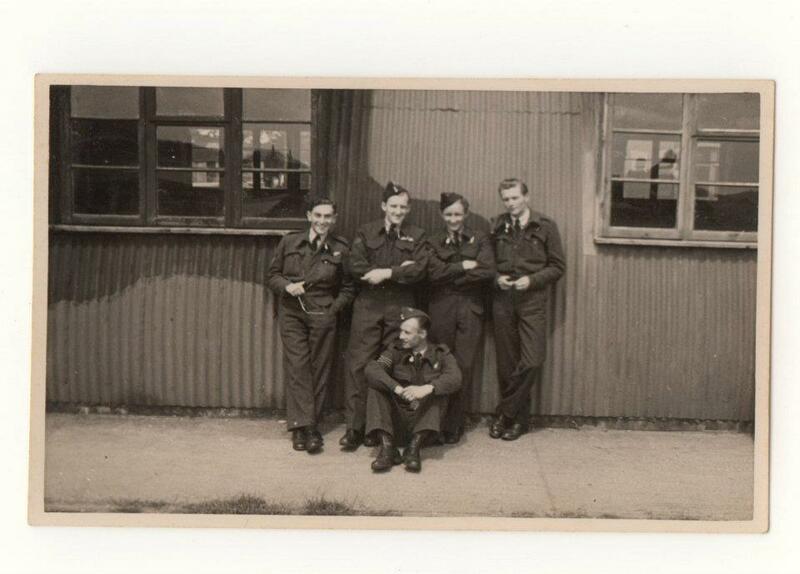 Cousin Jim had ‘borrowed’ F/Sgt Jacques’s crew for a local flying exercise during his short stay at Wickenby. Referencing the brilliant 626 informal group photo from http://www.626-squadron.co.uk/ has F/Sgt Jacques hunkered down in centre front, the wellington booted sergeant standing to his immediate left appears to be in this one too, seated fourth from the right in Lynn’s photo – possibly Frank Seddon? 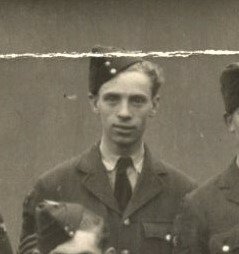 Harold Smith used to refer to a good friend of his – ‘poor Frank’ who is thought to have been killed on active service. Just as 625 Squadron’s record keeper suffered some confusion with the gunners Johnson, Sgt F R Smith appears in two aircraft on one op – with both Nicholls and Etchells, a slip of the typewriter keys – one of them should have read ‘H J’. I maintain that there’s a place in historical research for the educated guess and outright hunch. Was F R Smith the Frank Smith who signed the reverse of the photo? If so it is likely that the two would have been acquaintances at least. 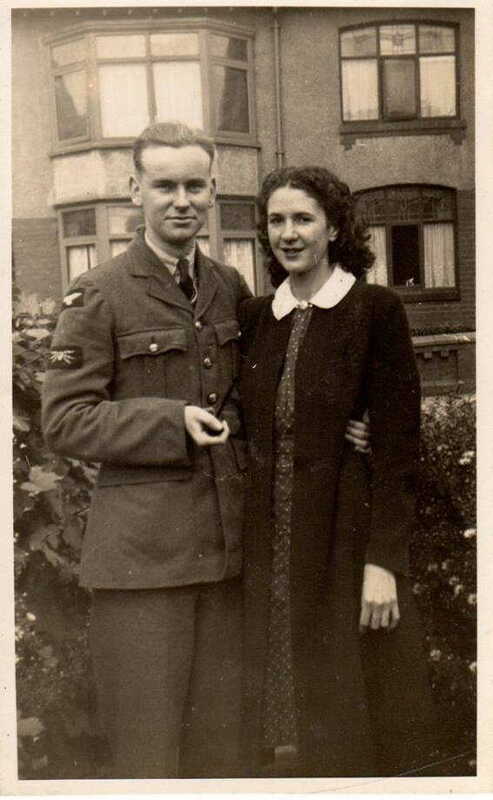 Many thanks to Julia for providing information and photos of her relative P/O Frank Raymond Smith, wireless operator/ air gunner who was lost on the ill-fated Nuremberg operation of 31st March 1944. P/O Smith was the w/op in the (by then) experienced 625 Squadron crew of 22 year old Acting Squadron Leader Thomas Nicholls. 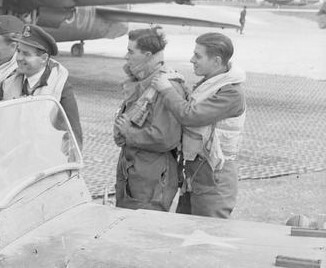 The Nicholls crew including Frank Smith arrived at newly established 625 Squadron on 23rd October 1943 from 1667 CU, the same day as the Etchells crew were posted in from 1667 CU. Frank Raymond Smith and ?…. P/O F R Smith, next but one to Harold in the w.op/ag group. 1578088 Sgt Cyril William Shephard, died on 7th September 1943 aged 21. Cyril was flying as w/op in Vickers Wellington Mk X LN379 on a training flight when engine failure soon after take-off caused it to crash near Chard, Somerset. The aircraft was from 310 FTU (Ferry Training Unit) RAF Harwell, although it seems that the crew were with No. 3 Overseas Aircraft Delivery Unit. Two other members of the crew died in the crash. 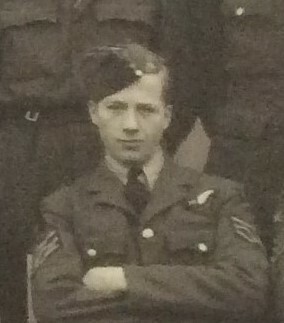 1324106 Sgt Leslie Dennis Perry also lost his life on ‘Black Thursday’ 16th/17th December 1943. 166 Squadron Lancaster JB639 – pilot P/O Arthur E Brown, having been given ‘prepare to land’ crashed into the ground near Little Walk Farm, Thornton Curtis, Lincolnshire, in very low cloud while trying to locate their home airfield RAF Kirmington on return from their attack on Berlin. Difficult to match candidates from both photos, but the chap sitting next to Don Savage bears a resemblance to three of the remainder in P/O Brown’s crew, second, third and sixth from the left…. 1395260 Sgt A A Mortimer, w.op/ag in 12 Squadron crew of Sgt John H Hawksley-Hill operating Lancaster JB407 on 29th/30th December 1943 – Berlin. The Lancaster was hit by flak south of Bremen, the aircraft was abandoned and eventually crashed at Hofkloster, Holland. Both gunners died – Sgt Edmund Podborchinski RCAF whose parachute failed to open and Sgt Cooke did not exit the aircraft. 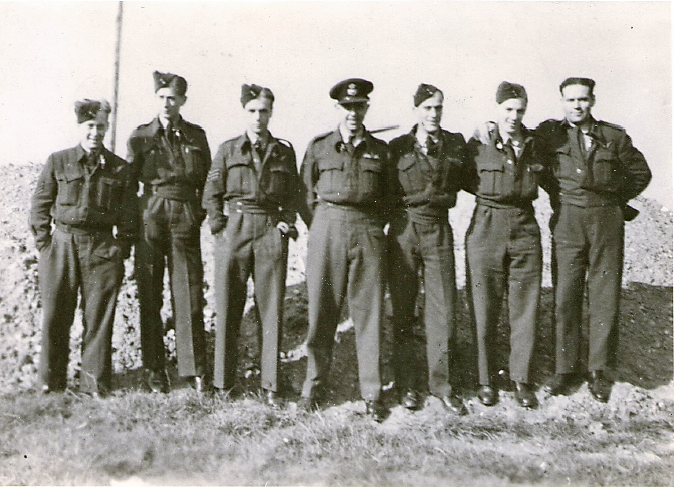 Sgt Mortimer was interned as a PoW at Stalag Luft 4B where his ‘kriegie’ number was 269894. Sgt Podborchinski’s service record confirms that the crew had come to operations via 30OTU Seighford and 1667CU (9/7 to 11/8 and 11/8 to 12/10). A A was probably Anthony A Mortimer, 20yrs of age at the time. As yet no luck with Sgts Rose or Ross. 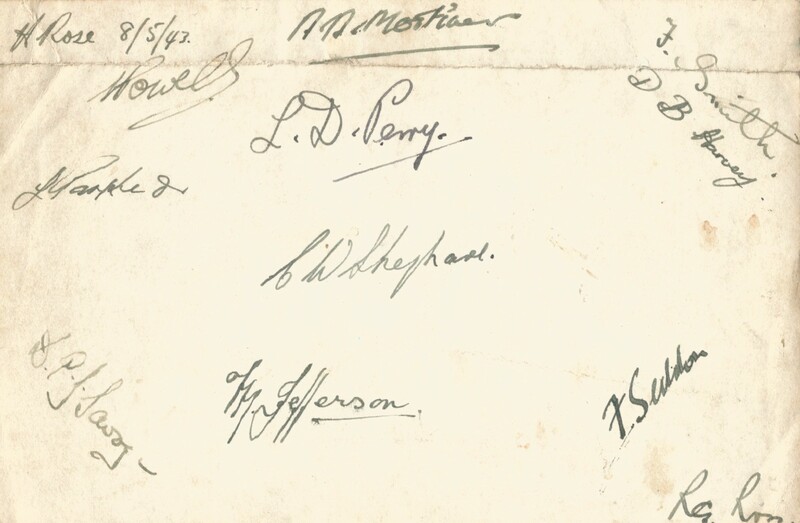 A couple of the signatures are not readily decipherable – any ideas? Powell, perhaps but the other? 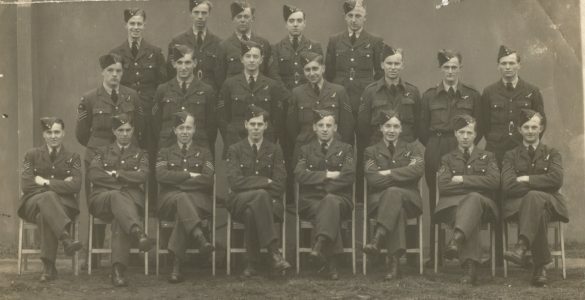 In checking other 626 Squadron photos I came across an airman showing a distinct similarity with the w/op second from left, back row. Whilst the crew names and their trades are known only the f/e can be identified. The w/op in this crew is Sgt E A Reynolds – significantly an ‘R’, however the crew didn’t come to operations until April 1944…..some aircrews’ progress through the system was, of course delayed for various reasons. However, there is a likeness, and the crewman is likely to be the w/op as he is not wearing flying boots. I also spotted a member of F/O Percy Aslett’s crew – possibly w/op F/Sgt Laurence Alfred Scott? 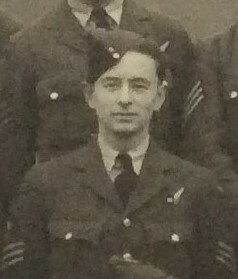 Aslett’s crew arrived at 100 Squadron on 8th September 1943 and was one of the ‘C’ Flight contingent that established 625 Squadron mid-October 1943. F/Sgt Laurence A Scott died on 23rd April 1944 when 7 Squadron (Pathfinder Force) Lancaster ND592 having bombed marshalling yards at Laon was attacked by a night-fighter and exploded, with the loss of the whole crew. The photo above the entry for my father, Sgt E.A.Reynolds is not him. I will attempt to find an image and post it. Either Chard in Somerst or Chardstock in Dorset. Just to add to my last comment CWGC lists Cyril Shephard as a casualty on 7/9/43. LN 379 Crashed in Chard, Dorset. I may have some details of T Britain and others that interest you as I have been researching our family history. My great uncle Flt Sergeant Roy Phillips was the Navigator on Wellington LN 379 . According to official records the aircraft suffered engine failure after take-off and crashed at Sycamore in Dorset on 7 September 1943. He was a member of 310 Ferry Training Unit and if anyone has any photographs of him could they post them. I am looking for a photo of RAF Flight Sergeant Harold SMITH DFM, details of his death and five other members of the crew are listed below. I would like the photo of RAF Flight Sergeant Harold SMITH DFM, to put on his findagrave.com grave so he will be remembered I found Harold’s grave at Cornforth Co, Durham while searching for my wife’s great grandparents. Vickers Wellington X HE276 took flight on a night navigation training exercise from its base at Silverstone. The port engine stopped while on approaching a landing following the flight; in avoiding crashing into another aircraft, which was on the runway, HE276 hit two trees and crashed, taking the lives of six aircrew and injuring two other aircrew members. RAF Sergeant John Buckland SPEAKE.